In first two TestLink tutorials (part 1 and part 2) we learned TestLink installation, creating a test project, test plan, test cases, requirements management, manual execution of test cases, and generating test reports. With this feature, you don’t have to login into TestLink each time to update the test case execution status. You can do it automatically using TestLink API. This will save your lot of manual execution time. To demonstrate this feature we are using Selenium WebDriver and updating the test case status along with test note in TestLink. Let’s have a deep look at – how to update test case execution status remotely through Selenium WebDriver code and TestLink API through XML-RPC call. All the steps explained in TestLink tutorial #1 should be done. You are using Selenium for test automation on your project. Test cases which are automated using Selenium can be updated in TestLink through Selenium code. – You can download java from here. – Double click on the exe file and install java on your system. – Download Eclipse for windows from here. – It will be downloaded as a zip package, extract and place it on your local drive. Download selenium-java jar and selenium-standalone jar from here. Download Junit 4.11 jar from here. Download Test Client API jars from here. For automated test case execution, TestLink API configuration should be enabled in the configuration file. TestLink has already deployed in Apache. Before doing any modifications in configuration file Apache should be stopped. To do that, open Control Panel -> System and Security -> Administrative Tools. Double click on “services” icon. Click on Apache 2.4 service and click on the “stop the service” link appearing on the left side. It will stop the Apache service. Open TestLink folder inside htdocs folder and open Config.inc.php file in edit mode. Change the following line to “TRUE”. config in order to answer or not a call. Open Apache service as described in Step 1 and start it. TestLink provides an API key for each user which is essential for updating Test case execution status in an automated way. Open TestLink URL in your browser and login with your user credentials. Open “My Settings” link on the TestLink desktop page. Click on the “Generate a new Key” button in the API Interface section. A new key will be generated and displayed on the page. 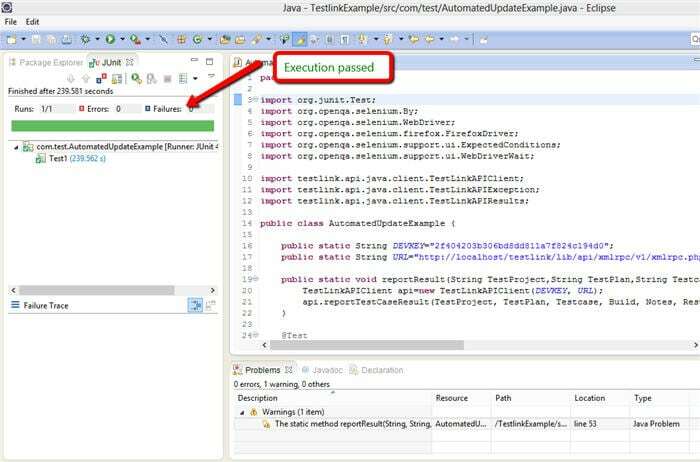 To update a Test case execution status through API, its execution type should be “Automated”. Note: If you are following this remote status update practice you can update the execution type to Automated while creating the test cases itself. Open a Test case and click on “settings” icon appearing on the right side panel. It will display a list of operations. Click on “Edit” button. Change Execution Type to “Automated”. Note down the Test case name, Test project name, Test plan name, and the build name. We will need these details in our Selenium code. Right-click on the Project, go to Build Path -> Configure build path, switch to “Libraries” tab and click on “Add External Jars” button. Click “OK” button. All jars will be added to the project build path. Create a class inside the package with name “AutomatedUpdateExample”. Depending on the execution of the test in Selenium, TestLink test case status will be updated as either “Passed” or “Failed”. If the code executed successfully without any exceptions then test case status will be updated as “Passed”. In case of any exceptions test case status will be updated as “Failed”. To execute code, just right click on the file and select Run As -> Junit Test. It will start executing the test. Now open TestLink in your browser and see the execution status for the test case. It should be updated. Hope we have clearly explained how to update TestLink test case execution status automatically using TestLink API. This again proves that TestLink is a good open source Test Management Tool, which can be used by manual testers as well as automation experts. With this, we are concluding our TestLink tutorial series. Feel free to post your queries in comments. The xml-rpc call to TestLink API method tl.getProjects failed. thanks for this. we are using Test link but not updating it automatically. we will now try to automate it. @Tanaya – Ensure , whether you’ve enabled API in Testlink Config file and check whether your Developer key is correct. If, Still you’re facing the same problem then, generate a new developer key and use it in your code. Vijay when you are going to cover Selenium on STH? we are waiting to see it since long. Thanks For the post , it is very useful for me to execute the testcases from test-Link using Jenkins. Can you please help me out for , how to extract the the Testcases within the build. i.e. Execute the all the testcases with in the build. Thanks for the post, i face an performance issue . when i run the script with multiple test case it take 1 min to update the status in testlink. i have 1000 testcases in repository (test Spec). I was able to automatically update the status of one test case in TestLink after the automation test was run in Selenium. But how to update the results for several test cases in a build. Please help me. Please share the code. Also even though I have added the dependency in pom.xml . Build is throwing error, package testlink.api.java.client does not exist. How to resolve this? Are you guys also facing the same error? Thanks for the post. It really helps a lot . It is throwing :The call to the xml-rpc client failed. Please someone help out with this. Appreciate your effort to explain the procedure. However I am looking for Test step level result logging. Your help will be appreciable. Thanks in Advance. I have tried this same for ubuntu12.04. I have found this error. I need to integrate selenium with testlink for automated testing. how to re-executes any test case failed in selenium tools ? This works great, Is there any way to log the test case step level result?. My Testlink is installed on a server. Could you please help me out with this problem? Superb article. Can we log bugs too in JIRA automatically if test case fails? By using this Testlink plugin, i si we can updatae the test step status ? I would like to know how to automatically update the number of test cases executed by each person in the project. How many test cases have not run, how many blocked. how many test cases are assigned to each individual. Hi, and thank you for great tutorials and articles! I’m new to software testing and automation, so I’m sorry in advance if this comes through as noob questions. I would like to accomplish updating test case execution status directly in TestLink with the help of Selenium. Is there any way to this working with c# and Visual Studio? If so, where can I learn to set it up? worked a treat! We now have integration for out selenium test cases, which is a big improvement. Does anyone konw if there is anything comparable with with QTP / UFT? Is it possible to Update TestLink Test Case Execution Status Remotely while executing Web Services automation? Do you have code or explanation for updating the Step wise result in Test Link. Thanks in advance. I want to install XAMPP for testlink. I am using windows 8 64 bit. Because of this i am unable to install. Please help me.. The call to the xml-rpc client failed. Download testlink.eclipse.plugin_0.97.11.zip and add all files after extract, it should work. Hi great tutorial but I’m having an issue which is the same with the other guys here. ” The call to the xml-rpc client failed” I’ve already updated config.inc in testlink root directory. I’ve also enable test automation API Key on my testlink test project. I’m using testlink-api-client 2.0. Thanks! after that, this code is running properly but not updating anything in testlink. Could anyone please help me resolving this issue.I just want to mark testcase execution in testlink through selenium webdriver. Thanks for the post, it helped me to update status through selenium. Only issue I see is it takes a lot of time to update the status in Testlink. I have nearly 300 cases and it takes almost 3 to 4 hours to update the status. Is there a quick soltuion to this, please let me know. We are using same in our project to update 300+ test cases through XML-RPC call and it is taking 4+ hours to update same. As we have totally around 2000 test cases to be updated. Can you please suggest the ways to increase its performance. Is it possible to Update TEST LINK Test Case Execution Status Remotely while executing Appium script? ?